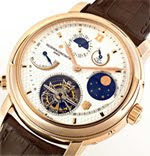 Only produced in a limited edition of seven pieces, this expensive watch is also the most complicated double-face watch. Tour de l’Ile is made with a totally original combination of horological complications (that is, features beyond the simple telling of the time of day) and astronomical indications composing a list of sixteen different points including a minute repeater, sunset time, perpetual calendar, second time zone, a tourbillion device, the equation of time and a representation of the night sky.At $1.5 million, this is one of the world’s most expensive watch produced in recent years. 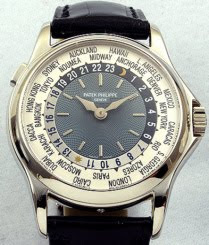 In fact, Patek Philippe had produced all of the ten most expensive watches in the world. The company, headquartered in Geneva, made their first wristwatch in 1868. They had already made a name for themselves prior to that, however, by providing watches to Queen Victoria herself in 1851. Other notable customers include Pope Pius IX, a king and queen of Denmark, an Italian king and Saddam Hussein’s son-in-law. 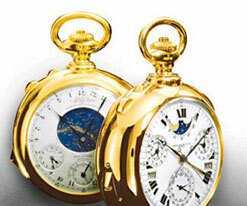 Chopard’s $25 million watchYes, you read that right: twenty-five million dollars. This gaudy timepiece by Chopard is adorned with three heart-shaped diamonds—a 15-carat pink diamond, a 12-carat blue diamond and an 11-carat white diamond. For good measure, they threw in 163 carats of white and yellow diamonds to bring the total to 201 carats of diamonds. The result is something that looks rather like a geode that’s been turned inside out and dipped in lemon Kool-Aid. Add to that the fact that the size of the watch’s face must make telling time into a fun game of Where’s Waldo and you’ll see that Chopard has truly created a recipe for success.